That cover art looks familiar, doesn’t it? Yep, “Crashing Suns” by Edmond Hamilton is the cover art I screen-grabbed years ago for a Vintage SciFi image. At the time, I had no idea who Edmond Hamilton was, and I was too busy with my own things to start meaningful conversations with people who took a look at the badge I’d photoshopped and said “Hey, I know that book!”. In my old age, I’m trying to get better. A few years ago, I was gifted with a gorgeous three volume set of The Collected Works of Edmond Hamilton. The way our living room is set up, this is one of the first things you see displayed on top of the bookshelf when you walk into that room. The back of the volumes feature cover art of novels, chapbooks, and magazines in which these novels, novellas, and short stories were originally published, and as I was flipping through, I saw artwork that looked mighty familiar to me (because I stole it). So OF COURSE I had to read the story! 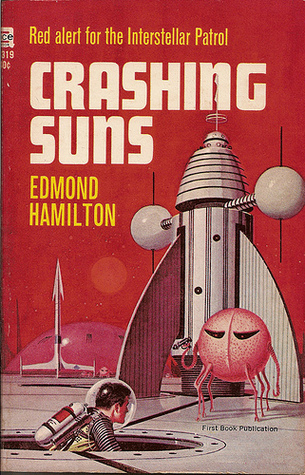 The story behind the cover art is “Crashing Suns”, which is Hamilton’s first story in his Interstellar Patrol sequence of interrelated stories. This was such a fun pulpy story! So many exclamation points, so many characters shouting, so many big bold adjectives. This is a story of big brassy sounds, saturated primary colors, and massive stakes (no there weren’t actually any brassy sounds or primary colors, but that’s my weird brain for you. But there are earth shatteringly large stakes for our heroes). At the beginning of the story, Earth gets news from an observatory that there is a star on a trajectory path towards our sun! And if it reaches here, obviously everyone will die!